This week’s Nielsen Soundscan charts will be greeted with cheers at Decca, whose latest monastery recording cleared more than 3,000 albums in the US. That’s the good news. The bad is that the next two best-sellers sold around 300 each and anything below number 7 sold fewer than 100. The US market is kaputt. 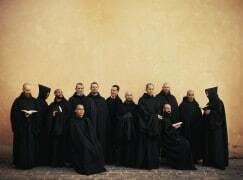 The moving music of BENEDICTA was recorded by a group of 18 men; half American citizens and half representing a variety of cultural backgrounds who collectively are heralded as one of the most authentic active singing communities of Gregorian Chant today. They are led by Fr. Cassian Folsom, Prior – an American who studied voice at the venerable Indiana University before joining the monastery. Fr. Cassian will make a rare visit to the United States on June 15 and 16, offering an unprecedented opportunity to learn about this community’s intriguing story first-hand. In addition to the monks daily monastic life devoted to prayer and music, they also strive to communicate their vision of life by way of “earthly experiences.” To that end, The Monks of Norcia operate a craft brewery at the monastery, Birra Nursia, where they produce brews that have gained devotees from distant countries, bringing new visitors to Norcia, adding to their compelling backstory in an unexpected way. It just makes sense. Music has been now commoditized, and the people who are buying these CD’s have no interest whatsoever in this industry. They simply need music for meditation or yoga. Its full circle now. Western music began with monks 700 years ago, it ends with them in Yoga parlors or as a way to make crying babies sleep. A utilitarian nuisance. Are you suggesting that nobody wants to listen to chant for its own sake? I beg to differ: we have a professional schola cantorum that performs Mass propers every Sunday. There is a young (not me) and growing demographic here in the U.S. for such things, i.e., chant used as originally intended and not just in a utilitarian or extra-musical way as a soporific for children. If the Benedictines who have preserved chant all this time can use their fine recordings as a way to support their apostolate, who’s to complain? (Beats selling coffee in my book.) You don’t have to buy it, you know. Quite an observation –“The US market is kaput!” Perhaps one day a new ‘Guido’ (when no longer adhering to a oath of silence), will sing out and proclaim — “Can’t – US (Stand) Firm – US’ and save music. But till then, thanks for keeping us up to date, Norman! I don’t see that the Monks at number one. I am surprised that Bocelli didn’t sell more than 100…..
That is the overall classical chart. It combines the traditional classical chart where the Monks would be along with more “pure” non crossover titles vs the classical crossover chart (the tenors/ most Bocelli albums, etc).